Shop Dome Greenhouse Kits from Gothic Arch Greenhouses !! Dome greenhouse designs -- one of the most energy-efficient greenhouse kits available -- enjoy indoor gardening year round using the best in solar greenhouse technology. A year-round greenhouse offers a unique indoor growing environment for organic gardening, an added living space to enjoy quality time engrossed in horticultural activities. 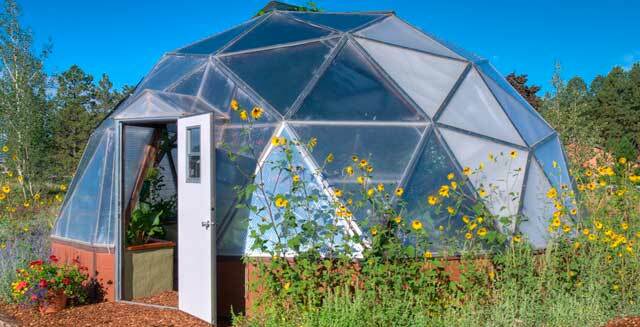 Dome greenhouses are designed for both tropical and cold hardy plants. The greenhouse kits are a unique, robust garden structure made from wood struts and metal hubs and covered by polycarbonate glazing panels making for a strong, relatively maintenance-free growing enclosure. Our Dome greenhouse designs are desirable for indoor gardening, and these year-round greenhouses make organic gardening possible even in harsh climates. Geodesic greenhouses allow families and communities to grow fruits, vegetables and flowers in a space that also offers a peaceful sanctuary perfect for relaxing for many years of enjoyment. WIND: The Dome is incredibly wind friendly as the wind simply flows around it. A rectangular greenhouse has a much larger surface area for the wind to push against making it an ideal structure for coastal and mountainous area where winds can be strong. SOLAR INPUT: The curved surface of the Dome allows for a very even heat input by the sun throughout the day. A rectangular greenhouse has a large flat area sloping south limiting the larger amount of sunlight to come in at mid-day, whereas in the early morning and late afternoon the light input is negligible. SNOW: The round shape also handles snow effortlessly because it allows snow to slide off naturally, so there's rarely, if ever, that much snow pushing down on the green house. ENERGY EFFICIENCY: Heat loss from any structure is proportional to the surface area of the structure. A spherical shape has the minimum surface area for the amount of floor space enclosed. The Growing Dome is much more effective at keeping the heat in on a cold winter night simply by having a lot less surface area through which the heat can escape. Covering :Our greenhouse design features high quality polycarbonate glazing panels for a clear, rigid translucent covering that allows 62% light transmission. The 16mm, 5-wall polycarbonate glazing of our geodesic greenhouses is rated R 3.0 and is one of the premier solar greenhouse coverings available. 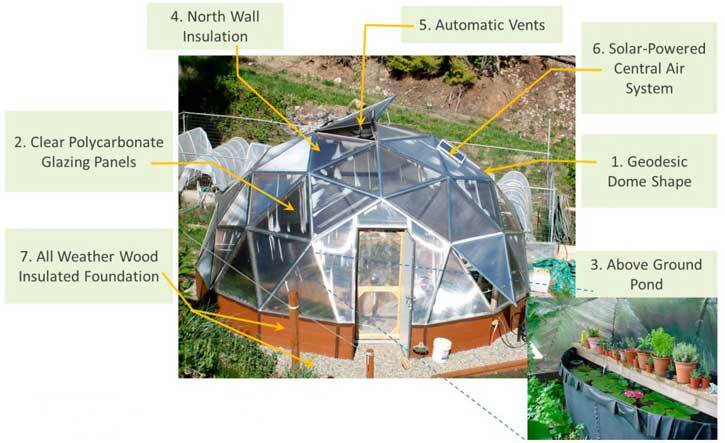 The dome greenhouse costs less to heat and cool than comparable greenhouses of similar size. Wood Insulated Foundation : Dome sits on a 24" foundation wall which raises the greenhouse up above the snow and gives increased headroom. Raised bed gardening in our geodesic greenhouses is simple and easy on the back! Solar-Powered Central Air System In the central air system (also known as the "under soil heating & cooling system"), a solar panel on the Dome greenhouse produces electricity to power a fan which blows the air inside the greenhouse through pipes buried in the perimeter raised soil beds. The air at the intake is warm in the winter and cool in the summer, so you are effectively heating or cooling your soil depending on the time of year. This Growing Spaces system also helps circulate air through the solar Dome to even out the overall temperature. One-of-a-kind in greenhouse designs, this feature makes year round growing a reality.